Royal Caribbean has released a new behind the scenes video featuring Mariner of the Seas during her massive dry dock which is taking place in Cadiz, Spain. It’s always good to take a look at what goes on during the upgrade and find out some facts. The cruise line released new footage where we’re taken behind the scenes of Mariner of the Seas at the shipyard in Cadiz, Spain. A total worth of $120 Million is being spent on amping up the Voyager class cruise ship with brand new spaces and features. You can read our original post on when the mariner of the Seas modernization was announced. 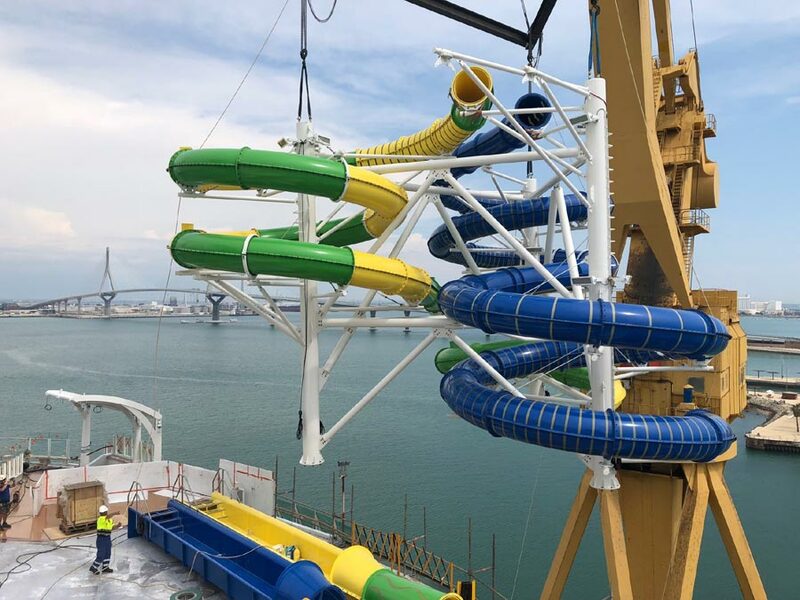 In fact, just about everything is being updated and a major part of that includes the top decks with a new virtual reality bungee trampoline experience at sea called Sky Pad. There will also be a new Flowrider installed, glow in the dark laser tag, new water slides, Playmakers Sports bar on the Royal Promenade and a new retro lounge called The Bamboo Room. Included in the video are some small snippets of key people involved in making sure the massive 33-day dry dock goes smoothly. It takes a lot of people to make such a big project work with 1,940 contractors are onboard from 54 different nations making things happen and bringing new updates to reality. There are also still 1,400 crew members on the ship preparing their departments for the first cruise guests later in June and beyond. Nothing is being missed during the refurbishment with around 1,100 containers being delivered to the ship. These containers can include all kinds of things like paint, new furniture and a lot more. Technical aspects are also receiving some attention and other areas which you might not expect like flooring, walls, carpets and no doubt some attention in the staterooms too. Once the dry dock is complete Mariner of the Seas will offer 3-night and 4-night cruises to the Bahamas. The Royal Caribbean cruise ship will showcase her brand new fresh look and features based out of PortMiami, Florida starting on June 25, 2018.